How Can Macular Degeneration Be Prevented? Macular degeneration is a serious eye condition that causes blurred vision and a reduction of central vision. When a person has macular degeneration, the macula becomes thinner. The macula is the part of the retina that is responsible for making the vision in your direct line of sight clear. The condition becomes worse over time and makes it difficult for a person to do certain things, like read or drive. Since age is one of the risk factors of macular degeneration, seniors stand a higher chance of being diagnosed with the condition. Poor vision in seniors makes it more likely that they will fall, so preventing conditions that cause poor vision, like macular degeneration, is very important. 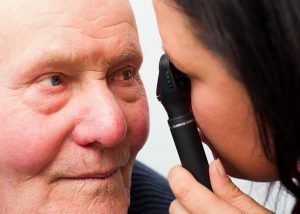 Here are some ways that you and your parent’s home care provider can help protect your parent against vision loss from macular degeneration. There are many other fruits and vegetables that contain antioxidants, so eating a wide variety of many different colors could help your parent to get enough antioxidants. Fish are also a food that is recommended for the prevention of macular degeneration. The omega-3 in fish seems to help protect the eyes. Wild caught salmon and small fish such as sardines are considered among the best sources for omega-3. A diet that is high in saturated fat has been shown to increase the risk for macular degeneration. Animal products are high in saturated fats as are some processed foods. Reading the labels of the products can help reduce the amount of saturated fat your parent consumes. If your parent has difficulty cooking, hiring a home care provider through an agency can help. Home care providers can visit your parent’s home and help them to prepare meals that contain lots of fruits, vegetables, and fish. Another important part of preventing vision loss due to macular degeneration is to be sure that your parent has regular eye exams. An eye doctor can monitor your parent for macular degeneration so that treatment can begin early if the condition does develop. Early treatment can help put off vision loss for a longer period of time. A home care provider can help your parent keep track of appointments and drive them to the eye doctor. If your parent should develop macular degeneration resulting in vision loss, a home care provider can help to keep your parent safe and independent in their home. Home care providers can help with tasks that become difficult or impossible due to vision loss, such as reading mail, cleaning the house, and driving. A home care provider can help give you peace of mind knowing that your parent is safe and still able to enjoy a good quality of life with help from a trusted caregiver. If you or an aging loved one are considering home care in Keyport, NJ, please contact the caring staff at Lares Home Care 888-492-3538 or 732-566-1112.